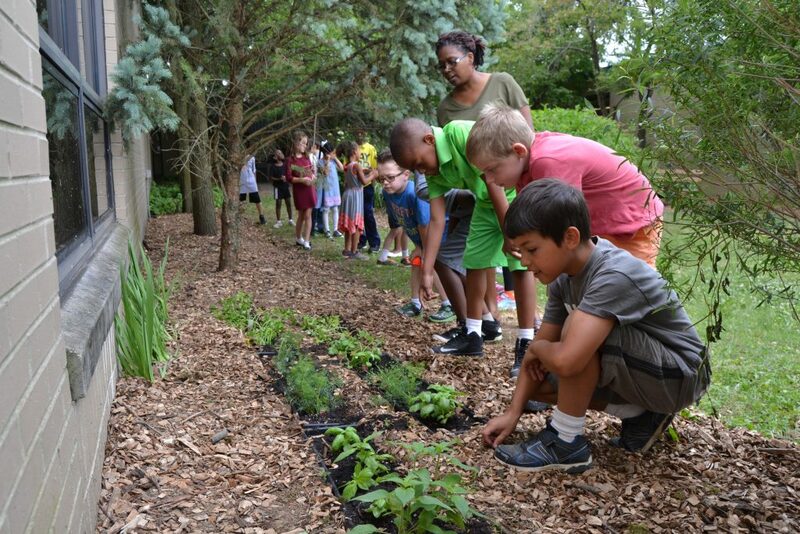 Carpenter Elementary’s renovated courtyard will serve as an outdoor science classroom aimed at helping children understand the natural world around them. Mrs. Archer’s fourth graders created fairy gardens in the courtyard. She said ducks nest and grow in the courtyard every year and watching them grow has been a great way to encourage class participation. “Now, with the bat house, butterfly garden plants and bird feeders along with manageable plants, we can expand our scope,” she said. 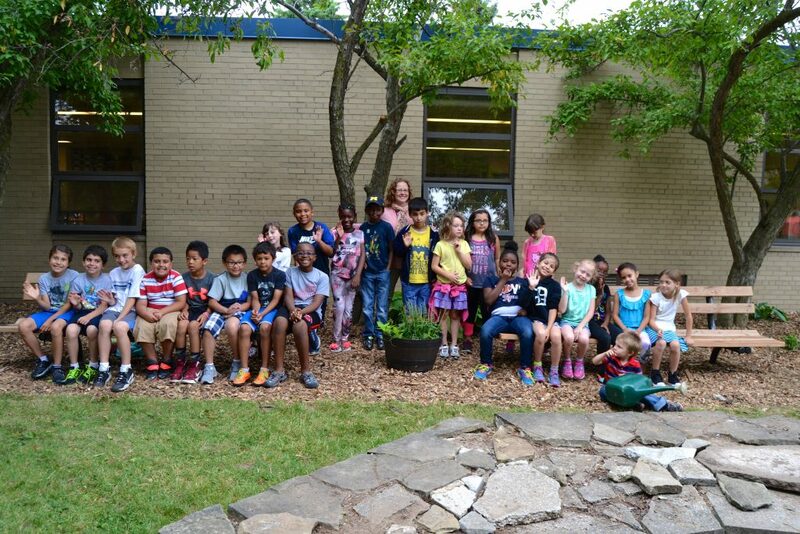 Kim Ulrich, who has a first grader at the school, was eager when the project began this spring to help beautify Carpenter and create an educational resource. Second grade teacher Jill Koeppe said the area will be used to complement the science curriculum. 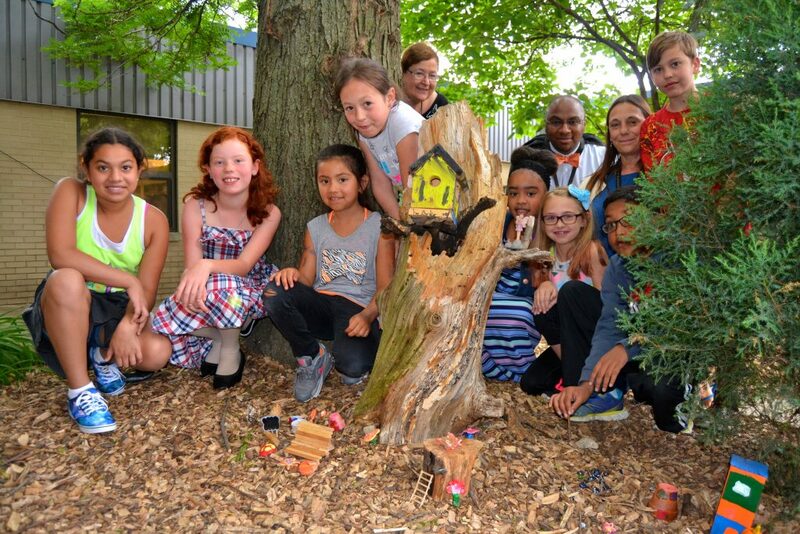 The departing fifth graders gifted the school with the birdfeeders, hummingbird feeders, and bat house, which teachers will use to teach about life cycles. 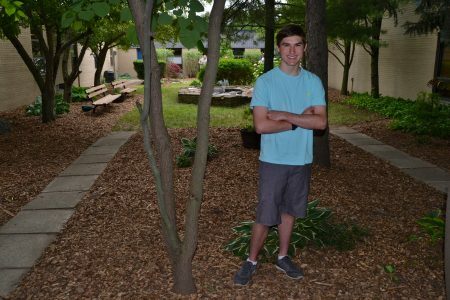 As part of an Eagle Scout project this spring, 2016 Skyline High School Connor Ward got in touch with Carpenter to see what kind of help they could use to promote its Ann Arbor Farm to School Collaborative. Connor Ward stands in the courtyard he helped renovate. Ward rounded up about 30 other volunteers to repair the benches, and hang bird feeders. “The ponds were just scum and alga and pretty gross,” he said. So they cleaned the smaller pond and refilled it, and cleaned the large pond, refilled it, and installed a pond pump that filters the water. They also constructed a garden box, divided hostas and planted other perennials throughout the courtyard garden. Many others contributed to the effort. Parents Emily Schildhouse and Glenn Timpe each gave $100, while Home Depot and Lowe’s donated materials totaling about $350. Outside, the raised beds will be cared for by families over the summer, with the hope that there will be herbs, lettuce, kale, carrots and greens in the fall. 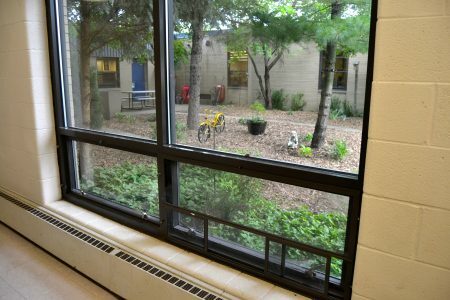 Borders said that she and art teacher, Karen McDonald use the courtyard for its artistic value, and will be making and adding ceramic and metallic wind chimes next year to enhance the natural sound of the environment. “It’s been a great learning experience for everyone,” she said.